So although this might offend a lot of people that have given me the wonderful, thoughtful gift that is manju, I have to just come out and say it already. I guess it might be the fact that I just barely tolerate azuki beans. Then there’s the not quite tasty and flaky crust that sends crumbs flying in 10 different directions upon the first bite. It’s just one of those things that I pretend to like just because I simply have to tell people how great it tastes, when really all I do is try to swallow it without spitting it out. Then I get my kids to eat it or take it to work and pass on the guilty-must-eat-to-be-polite feeling until it’s all gone. I mean, some people must like it, right? Anyway, this leads to a visit from my family. 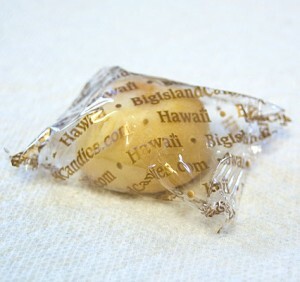 When I saw the box of Big Island Candies coconut manju from my Aunty B, I had that old feeling of dread. Still, I was definitely more willing to try it since it was filled with coconut instead of overly sweet beans. They were individually wrapped in the usual Big Island Candies wrapper and were about the size of a silver dollar. What a total shocker, this thing tasted amazing. I loved it! It was like a soft shortbread cookie with a perfectly sweetened chewy coconut middle. The coconut wasn’t shredded, which can turn some people off, and it wasn’t too sweet. It simply tasted like sweet coconut and blended very nicely with the outer, buttery cookie outside. This is the not the manju I’ve eaten in the past and I’m glad that someone finally had the bright idea to put something else into the middle of it and to make a tastier outer crust. The biggest disappointment of this thing was that it was too small. 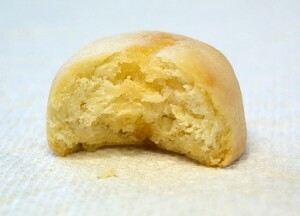 What I’d first thought of as a positive thing (less of the manju to try to enjoy) is now a negative. I found myself wanting to hide the box so that I could eat them all. My husband doesn’t like coconut, so I could count on eating his. My son doesn’t really like to try new sweets and isn’t into them in general, so I just kinda forgot to offer him some. This left Baby Girl, who loves coconut and loves sweets and loves cookies so she was my main competition. I let her eat two, then gave her one for school for a snack. The rest were all miiiine! The box says they should be consumed within 7-10 days of purchase, which may be why I can’t seem to find it for purchase online, which is a terrible shame. This is definitely going on my list of “Please bring from home” items whenever my dad comes to visit! If you happen to be in Hilo for a visit or live in Hilo and are looking for a new omiyage (besides the same old cookies) to take with you to the mainland, definitely give this a try. I give it two thumbs up!